This is an Italian Classic and a great place to start for an intermediate rider who has never been to Italy or one that cannot get enough! If you ride almost daily, seek a cultural immersion into a new land, and want to see more in less time, then this tour is for you! There are few better ways to fully immerse yourself in this land of light, history, and vine than this quintessential Tuscany bike tour. Find yourself gliding down lanes gilded by the Tuscan sun for seven glorious days, as we bring you unforgettable cycling adventures in this most fabled of Italian regions. 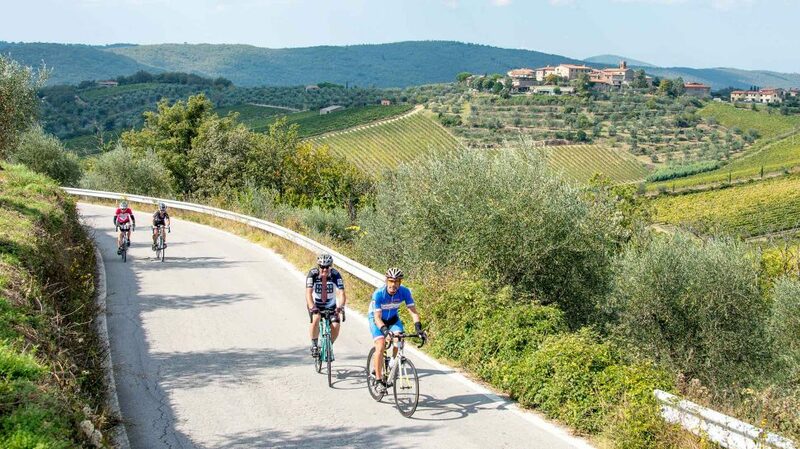 From the quaint town of Radda in Chianti to the photogenic landscapes of San Quirico D’Orcia, our biking tour through the magnificent Tuscan countryside has, as its backbone, the famed Via Chiantigiana. Literally meaning “Chianti Street”, this most classic of Tuscany cycling routes reveals the heart of the Chianti wine region in all its splendor. Rich with color, all around are views worthy of a Renaissance painting—alive with bright wildflowers in the spring, darkened with crushed grapes in the fall. Our Tuscany bike tour also features a visit to Siena, where a languid medieval air lingers amidst its twisting streets of warm ochre buildings. Strolling its narrow maze of cobblestone alleys you’ll make an amazing architectural journey. Explore delightful piazzas, intricate displays of masonry, and its superb marble cathedral, before climbing the Torre del Mangia, Siena’s most famous tower, to enjoy its breathtaking views. Chianti is a wine practically synonymous with Italy itself, benefiting from an unparalleled terroir that nurtures the best in Italian reds—something you’ll quickly appreciate on our Tuscany cycling adventures. We’ll pedal first to Montalcino, hometown of the most famous Tuscan red, Brunello di Montalcino. We also track through Greve and Panzano, literally immersing ourselves in Chianti along the way! Complemented by outstanding meals, you’ll also learn from the experts about the finer points of Tuscan cuisine, and its wonderful olive oils. 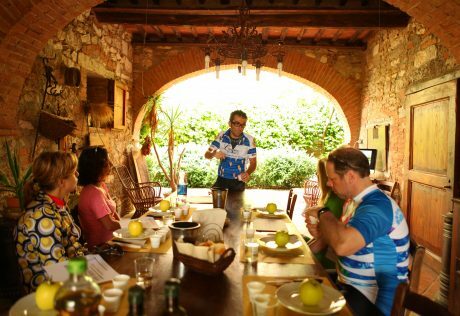 Visiting the homes of renowned local producers (some of whom are your Ciclismo Classico guides), you’ll take part in cooking lessons in authentic Tuscan cuisine. We’ll also visit the UNESCO World Heritage Site of Val d’Orcia and ride the “Crete Senesi,” one of the most beautiful Tuscany bike routes. Benvenuti to Tuscany! After our 11.30 group shuttle from Montevarchi train station, we will get together at 12.30 in the hotel lobby, we’ll get together at 12:30 pm in the hotel lobby for lunch and a brief introduction talk. In the afternoon after a bike fitting, we’ll ride to Castellina in Chianti to have a coffee in the main square or stroll around town. An optional extra loop will take you to Lucarelli after a long and fun descent immersed in the Chianti vineyards. Palazzo Leopoldo is a wonderful villa in 1800 style in the historical center of Radda in Chianti. The building dates back to 1300. Today we’ll ride on the Chiantigiana road through the Chianti region of Italy! Our landscapes are farms and vineyards, towering Cypress trees and olive groves, and ancient and historic buildings. This is the land of the Gallo Nero, the symbol of the Consorzio Chianti Classico, the organization that protects the Chianti Classico wine and its trademark. An extra loop takes you to Badia a Coltibuono (Abbey of the Good Harvest), an abbey founded in 1051 by Vallambrosa monk. Today we’ll leave the Chianti region for another beautiful ride and an extra loop to Castagnoli. We’ll cycle to the medieval city of Siena. En-route, we’ll stop for lunch and a wine tasting at the Felsina Vineyard. Siena’s heart is its central piazza known as Il Campo, known worldwide for the famous Palio run here (it’s a horse race run around the piazza two times every summer). In the afternoon, our local guide and friend will take you for a tour of this UNESCO World Heritage site and after, you will have a dinner on your own in town. Villa del Sole is just a short walk from the Piazza del Campo as well as many restaurants and shops. Its rooms are beautifully decorated and the staff are more than accommodating for all guests. Today is a rest day in Siena. There is an optional loop ride out of Siena to the medieval walled town of Monteriggioni in the morning. In the afternoon, a friend of ours will invite us to her family’s home where we will meet her family. You’ll learn how to make pasta from scratch, costine (skewers), or tiramisù. 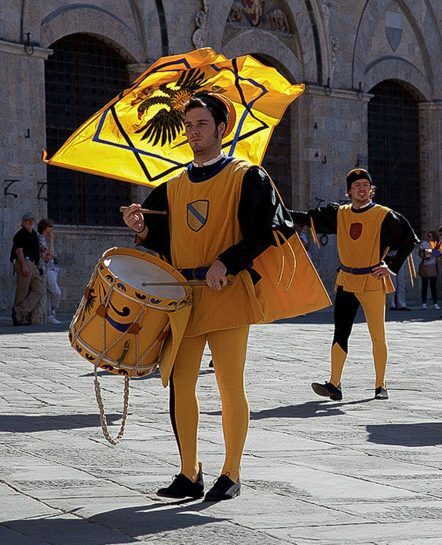 You will truly enjoy your stay here while listening to live, traditional Tuscan folk music played by special people! We’ll ride through the “Crete Senesi,” a range of clay hills situated between Siena and the Val d’Orcia. With its ever-changing seasonal colors, its winding roads and the lunar landscape of its clay ridges, this ride is considered a cycling classic in this part of Tuscany. Lunch today will be at the home of our guide Sandro and his wife Elisa at their beautiful Agriturismo il Molinello. You’ll be treated to traditional Tuscan cuisine prepared by the family and after lunch, Sandro will guide you through a tasting of their own olive oil. The 4-star Palazzo del Capitano is a restored ancient mansion from the 15th century and combines tradition with modern comforts. Today we’ll ride in the UNESCO World Heritage Site of Val d’Orcia. We’ll ride to Montalcino, hometown of the famous Brunello di Montalcino Tuscan red wine. From the top of the town we are rewarded with views of the Asso, Ombrone and Arbia valleys, dotted with olive groves, vineyards and small villages. 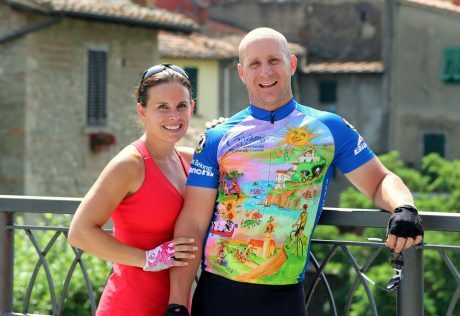 After a picnic, we’ll head to the home of Ciclismo Guide Giuditta, whose family owns a small winery called Nostra Vita. Here, they produce the best Brunello di Montalcino and Rosso di Montalcino. 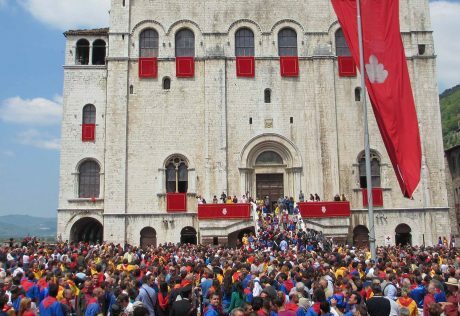 After breakfast at 9 am we offer a 45-min group shuttle to Chiusi-Chianciano train station. From there, you can connect to Florence or Rome in less than 2 hours.